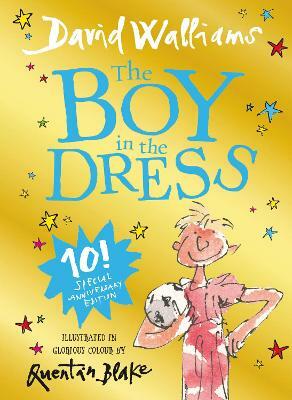 David Walliams' bestselling book The Boy in the Dress has gone FULL COLOUR in a brand-new anniversary edition. This beautiful hardback gift book is the perfect present for children of any age, and contains an introduction from David Walliams himself. Available for a limited time ... read full description below. David Walliams - comedian, actor and author - continues to take the children's literary world by storm. His tenth novel, BAD DAD, was an immediate number one, following the triumph of THE MIDNIGHT GANG, the biggest-selling children's book of 2016. WORLD'S WORST CHILDREN 2, which published in early 2017, spent four weeks at industry number one and eight weeks at the top of the children's chart. They have achieved unprecedented critical acclaim - and RATBURGER, DEMON DENTIST and AWFUL AUNTIE have all won the National Book Awards Children's Book of the Year. David's books have now exceeded 100 non-consecutive weeks in the children's number-one spot, and have been translated into 53 languages, selling more than 26 million copies worldwide.